April 4, 2019 in category Chamber Blog tags komatsu, Komatsu Mining Corp, leadership, leadership development, leadership program, Leadership Venango and 0 comments. 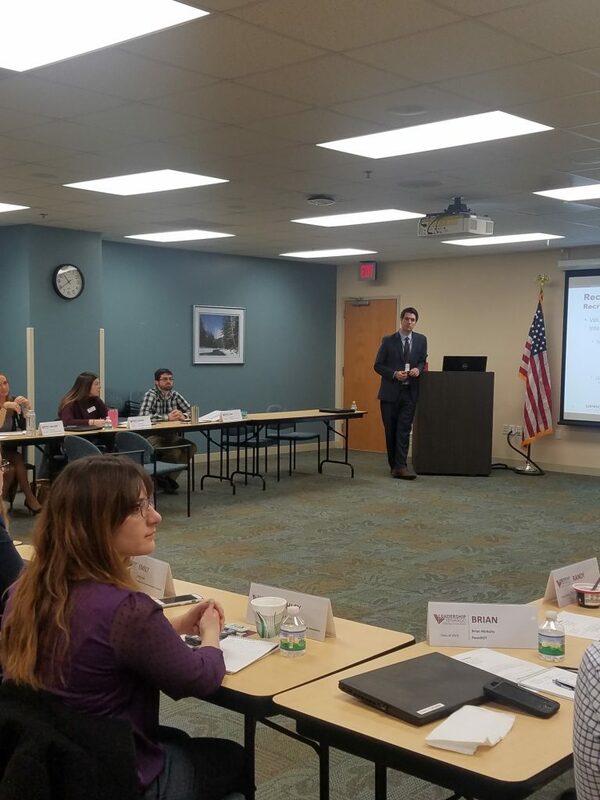 The 2019 class of Leadership Venango met for their seventh session to learn and discuss diversity, local economic development, and conflict management. 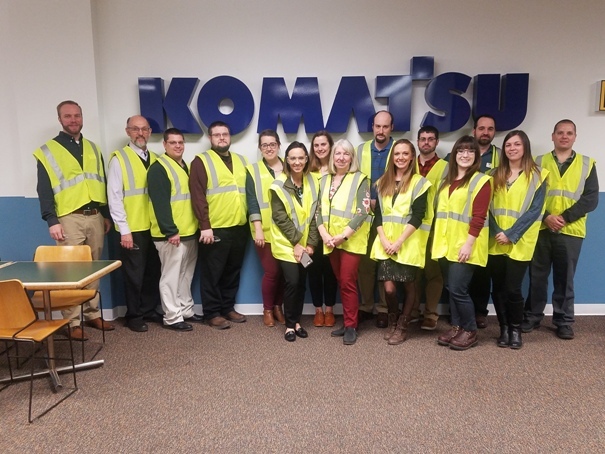 The session was hosted by Komatsu and included a tour of the research and development facilities the company uses to move their product forward. Komatsu’s Alan McBride provided the first presentation on Komatsu’s approach to inclusion and diversity. There is a strong business case for making sure your teams are focused on respect and having an open mind. Having or allowing personal judgements in a group causes people to shut down and dampens creativity. Alan shared how one of the biggest hurdles can be getting the executive team to buy into the value of diversity and actively promote open mindfulness. Working with people who are different is all about learning what we can from people who see things from a different perspective. The biggest areas for improvement include gender diversity, disability inclusion, and cognitive diversity. Cognitive diversity is simply accepting different ways of problem solving and different methods of thinking. Left unchecked, unacceptance of different ways of thinking will obstruct a productive work environment. 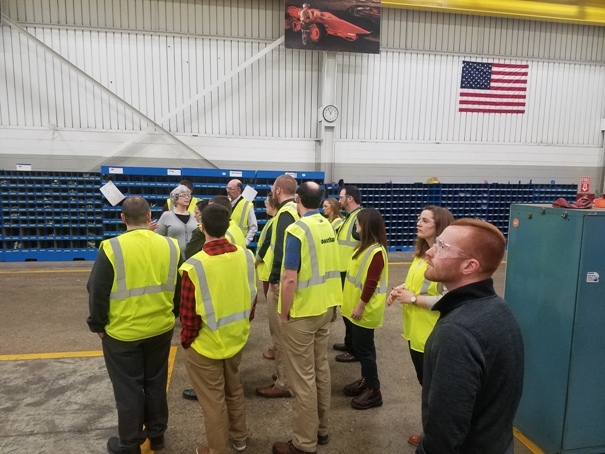 Alan also shared with us how, as a company, Komatsu works toward development of individuals in these types of areas through professional networking and mentorship. The second part of the morning involved an “MBA in an hour” where Frank Hajduk of SCORE discussed economics and particularly, the economics of the local economy. He provided input on the capitalist and socialist dynamics of the American economy. A lot of focus was put on our local economy, its history, its potential future, and what it needs to succeed. The local economy is defined by its job centers and everything within a one hour travel time. One of the most important dynamics, according to Mr. Hajduk, is the flow of money and product into and out of the local economy. If money is brought into the area, the area will see economic growth, but if money is carried or spent outside of the local area, it hurts the local economy. This stressed the importance of the shop local mentality and the Be Here initiative. The final discussion was brought by Pamela Watkins about conflict management. Pam is an experienced human resources (HR) professional who is the director of HR at Matric Limited and provides HR consulting through Watkins HR Strategy. There are many things that create conflict in a workplace and in any group involving people. The discussion of causes of conflict correlates closely with the discussion on diversity. Many of the biggest issues start with barriers to communication and respect of peoples’ position and perception. There are many methods that people use to deal with conflict ranging from detrimental to constructive, and the most constructive way may not always be the same. In the end, there are real and measurable costs associated with conflict. Building on the theme of the day, we need to learn how to manage conflict as part of maximizing productivity and enhancing the benefits of life in the local economy. Pam challenged the group with further reading of the book Fierce Conversations by Susan Scott. Leadership Venango will meet again on April 10 at the Venango County Fairgrounds on Empowering Your Community. For more information, visit leadershipvenango.org. February 14, 2019 in category Chamber Blog tags leadership, leadership development, leadership program, Leadership Venango, upmc, upmc northwest and 0 comments. On January 9, the class of Leadership Venango met at UPMC Northwest for an enlightening session about achieving a healthy community. 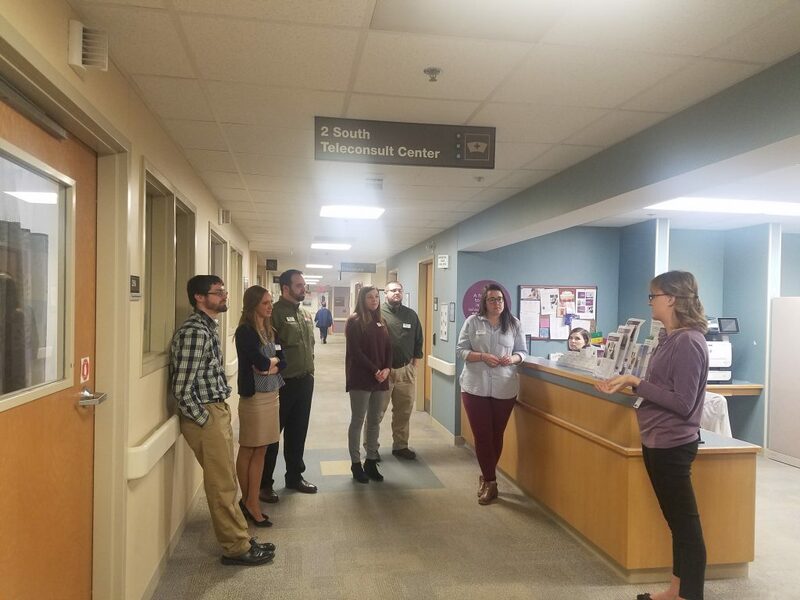 Joyce Morgan, Director of Patient and Community Relations and Diabetes Center, and Cheri Siverling, Director of the Family Birthing Center, shared some of the struggles Venango County faces from a healthcare standpoint. UPMC Northwest conducts a Community Health Needs Assessment (CHNA) every three years. The hospital identifies three areas of significant health needs of our community. Resources and programs then center around these areas. Currently, the areas of focus are diabetes, respiratory diseases, and maternal infant health. Joyce highlighted the Better Breathing Clinic and Smoking Cessation classes that UPMC offers, as well as the opportunity for individual instruction with a Diabetes Educator. Cheri discussed the high occurrence of Neonatal Abstinence Syndrome (NAS) in Venango County. NAS is a group of problems associated with withdrawal that occurs when a baby has been exposed to certain drugs in the mother’s womb. Sadly, Venango County is the 3rd highest county for infants diagnosed with NAS, according to the PA Healthcare Cost Containment Council Bulletin in December 2018. Many services are available to help these families through Human Services and Community Services. The class then took a quick tour of the new Hillman Cancer Center, TeleMed unit, and Stroke unit and got to hear about the successes of each. Though UPMC Northwest is located in a smaller community, they offer many state-of-the-art services to their patients and are on the cutting edge of new technology. Brian Durniok, President of UPMC Northwest, spent some time with the class following lunch. He discussed his management style, the importance of delegating, and how he empowers his employees to make quick decisions. The class was able to spend some time in a dynamic discussion on current affairs of the hospital and healthcare in general with Brian. The class ended the day with Joe Croskey, who is a Mindfulness Coach and Assistant Professor at Clarion University. Joe led the class in meditation and breathing exercises and talked about how to be a mindful listener. He spoke on the importance of self-awareness and emotional intelligence, and reminded the class to be intentional with themselves and others. This article was published in the Venango Area Chamber of Commerce’s February 2019 VenangoWorks! Newsletter. January 28, 2019 in category News tags clarion university, leadership, leadership development, live 2 lead, sbdc, small business development and 0 comments. Live2Lead is a half-day, leadership development experience designed to equip attendees with new perspectives, practical tools and key takeaways. You will learn from world-class leadership experts, be prepared to implement a new action plan, and start leading with renewed passion and commitment. Facilitated by Scott Schoenberger of The John Maxwell Team, this on-site video seminar will include presentations by John C. Maxwell, Carly Fiorina, Daniel Pink, Debra Searle, and Tyler Perry. This is what you can expect to gain from this event: How to recognize the opportunity for a shift, knowing the right time to make a shift, choosing to make a shift, the hard work that goes into shifting, and what kind of shift every leader needs to make. This article was published in the Venango Area Chamber of Commerce’s January 2019 VenangoWorks! Newsletter. December 17, 2018 in category News tags community caregiving, leadership, leadership development, leadership program, Leadership Venango, venango chamber, venango county and 0 comments. The 2019 Class of Leadership Venango met on November 14 at the Cranberry Place in the Cranberry Mall. The third session of the nine-month program was focused on understanding community caregiving. The class started their day by working on class projects with their teams and were then joined by Deb Lesko of Venango Catholic High School to focus on project management. The next guests, Kathleen Ellwood and Joe Croskey of KECoaching and Consulting, LLC, connected with the class to explore diversity. They had the class participate in a few activities that concentrated on the dimensions of diversity and discrimination. Before lunch, Susan Williams, President & CEO of the Venango Area Chamber of Commerce, facilitated a panel discussion regarding Venango County caregiving. The panel guests included: Mary Jean Gavin of Community Services of Venango County, Jane Byham of Wesbury Retirement Community, BreAnn Chisholm of Child to Family Connections, and Rina Irwin of Child Development Centers Inc. The panel focused on the 40 Developmental Assets and their connection to each stage of life. The class took a break mid-day for lunch, after which they heard a presentation from Joyce Fosdick, Executive Director, and Libby Hansford, Service Learning Director, of Keystone SMILES Community Learning Center. Their presentation centered on their involvement with AmeriCorps, as well as leadership practices and understanding the different components of poverty. This session was very interactive and had the class on their feet and participating in different role-playing activities. Many class participants felt this session was one of the most impactful and emotional yet. The next session is scheduled for December 12 at PennDOT, where the class will focus on maximizing clean communications. For more information, visit leadershipvenango.org. This article was published in the Venango Area Chamber of Commerce’s December 2018 edition of the VenangoWorks! Newsletter. October 15, 2018 in category Chamber Blog, News tags future leaders, leadership, leadership development, Leadership Venango, professional leadership program, retreat, venango chamber, whitehall and 0 comments. 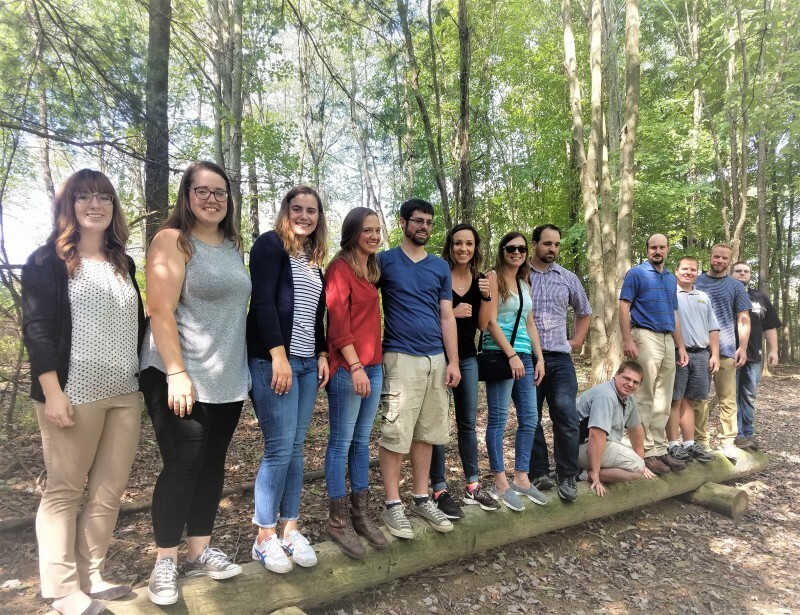 The 2019 Class of Leadership Venango got off to a great start on Friday, September 21st with a full-day retreat held at Whitehall Camp and Conference Center in Emlenton. 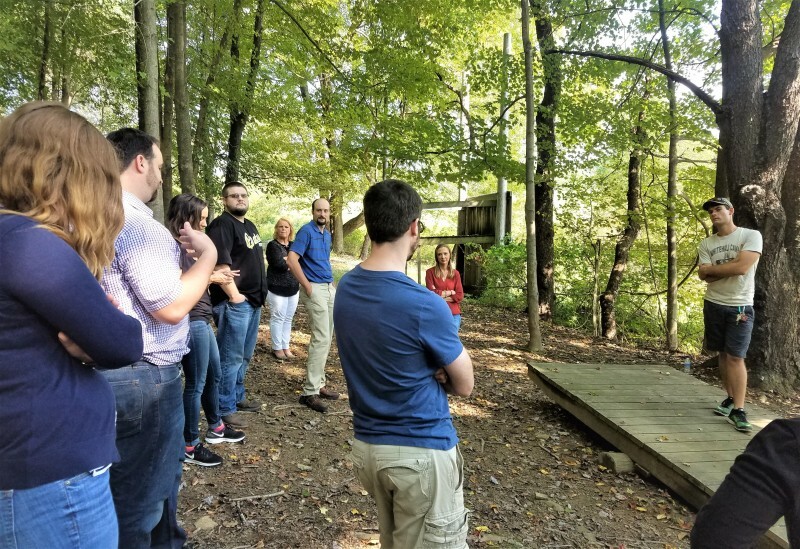 The class of 13, representing all areas of the county with a diverse mix of men and women in different fields and various positions of leadership, took part in team-building, personality testing, visioning exercises, and more. Lance Hummer, executive director of the Keystone Community Education Council, started the day with personality testing that allowed the participants to both see themselves more clearly and to better understand each other. Team-building exercises, led by Whitehall staff, helped the participants to break down their walls and communicate with one another in a dynamic way. During a discussion about what our ideal community would look like, the class had an energetic exchange that led them to choosing a topic for projects they will work on throughout the program. The class will spend the next 9 months meeting once a month in locations all over the county, focusing on themes like honorable leadership, business and economic development, and maximizing clean communications. Each session will feature members of the community as both speakers and facilitators, allowing the class the opportunity to make valuable connections that will be an asset to them in future endeavors. This article was published in the Venango Area Chamber of Commerce’s October 2018 edition of the VenangoWorks! Newsletter.